Eastern Washington Eagles Mitchell Johnson (94) and Jonah Jordan (91) sack Maine's quarterback Chris Ferguson during the first half of a college football game on Saturday, Dec.15, 2018, in Cheney, Washington. The University of Maine’s unexpected and unprecedented run toward a potential Football Championship Subdivision national championship came to a screeching halt on Saturday afternoon. 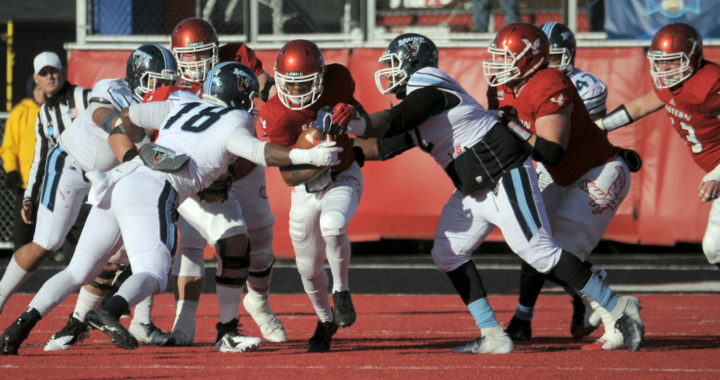 Eastern Washington University had its way with the Black Bears’ defense, jumping out to a 28-0 lead on the way to a 50-19 victory at Roos Field in Cheney, Washington. Redshirt sophomore quarterback Eric Barriere threw seven touchdown passes, including four to redshirt senior wide receiver Nsimba Webster, to lead the Eagles past the Black Bears. Seventh-seeded and No. 12-ranked UMaine closes out its best season ever at 10-4. Third-ranked and No. 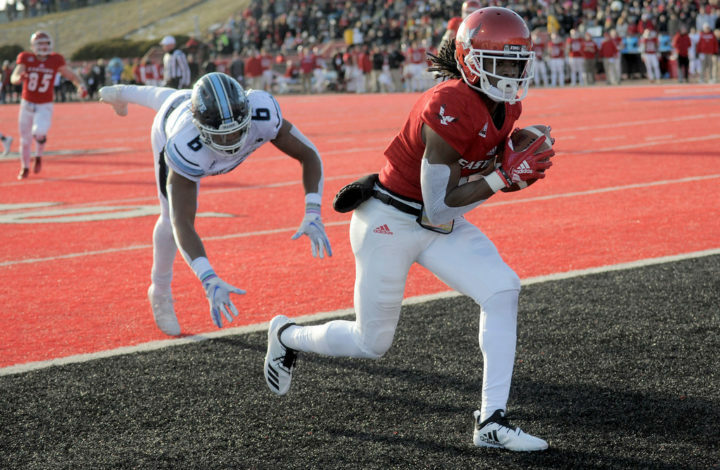 3 seed Eastern Washington, 12-2 including an 8-0 record at Roos Field, advances to take on 14-0 and top seed North Dakota State in the national title game Jan. 5 in Frisco, Texas. The Black Bears became the first team in program history to win two playoff games and reach the FCS semifinals. The Black Bears had a record-setting offensive showing in the 55-27 victory over Jacksonville State. Sophomore quarterback Chris Ferguson’s five touchdown passes, UMaine’s 55 points and 42 first-half points were all school records. Eastern Washington quarterback Eric Barriere runs the ball against Maine during the first half of an NCAA college football game Saturday, Dec. 15, 2018, in Cheney, Washington. The defense also turned in a stellar performance against the high-powered Gamecocks, registering four sacks and holding them to 87 rushing yards on 32 carries. 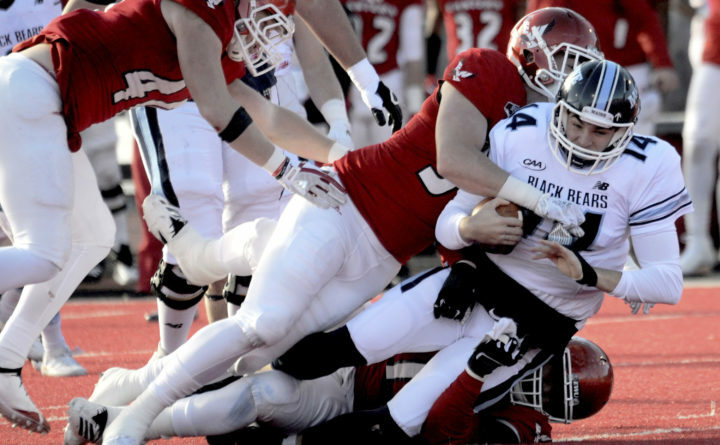 The Black Bear defense was the story in the quarterfinals as they upset second seed Weber State 23-18 in Ogden, Utah, as they came up with four interceptions and held Weber State to minus-one rushing yard. Weber State running back Josh Davis, the FCS Freshman of the Year who finished with an average of 113.5 rushing yards per game, was held to 12 yards on 11 carries. The UMaine offense struggled against a stout Weber State defense but Ferguson threw a nine-yard touchdown pass to Jaquan Blair with 2:05 left in the first half to give UMaine a 7-3 lead and a 67-yarder to Earnest Edwards just 1:28 into the second half to expand the lead to 14-3. A 45-yard TD run by Ramon Jefferson with 2:56 left in the game gave the Black Bears a 20-12 lead and Kenny Doak kicked a 46-yard field goal 1:22 later to sew up the victory. UMaine’s unexpected push all the way to the national semifinals did not come without tragedy, doubt and plenty of challenges on the field. Freshman defensive back Darius Minor collapsed and died of a heart condition during a freshman workout session on July 24. That team dedicated the season to their former teammate and kept his No. 39 jersey always on hand to honor his memory. Eastern Washington'S Nsimba Webster (5) scores a touchdown against Maine defender Kayon Whitaker (9) during the first half of a college football game on Saturday, Dec. 15, 2018, in Cheney, Washington. Just five weeks after the death of Minor, the motivated Black Bears trounced arch-rival and nationally-ranked New Hampshire 35-7 to end an eight-game losing streak at the hands of the Wildcats. The following weekend the Black Bears visited Football Bowl Championship Western Kentucky and found themselves trailing 21-0 just 5:03 into the game. But the resilient Black Bears battled back and pulled out a dramatic come-from-behind 31-28 victory. Ferguson was injured early in the next game, a 17-5 loss to FBS team Central Michigan, and redshirt freshman Isaiah Robinson took over. With Ferguson sidelined, Yale University dealt the Black Bears a 35-14 loss. But the Black Bears again proved resilient, winning seven of the last eight including five in row leading into the Weber State game. The first two victories in in the 7-1 stretch featured last-minute drives engineered by Robinson and Ferguson, respectively, that led to game-winning field goals by Kenny Doak of 52 yards in a 13-10 win over Villanova and a 39-yarder to edge the University of Rhode Island 38-36. UMaine trailed URI 30-14 in the second half. Following a 27-20 loss at William and Mary, the Black Bears reeled off wins over Albany (28-9), Towson (35-28), Richmond (28-9) and Elon (27-26) to claim the CAA championship for the first time since 2013.